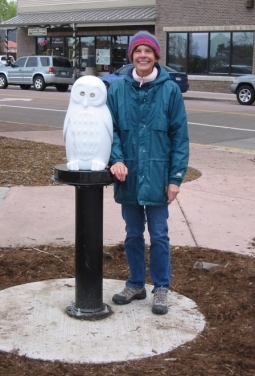 Ellen Woodbury’s “See Through Other Eyes: Spotted Owl” was installed in O’Brien Park in Old-Town Parker, Colorado, on May 7, 2015. This one-of-a-kind interactive sculpture is on display at the corner of Main Street and Victorian Drive from May 2015 through May 2016. The display is part of the Douglas County Art Encounters program. for doing the heavy lifting! “See Through Other Eyes: Spotted Owl” invites the viewer to look through the eyes of an owl and see the world from the perspective of this endangered species. Spotted Owls are an apex predator in old-growth forests. As the forests are being cut down, the habitat of the Spotted Owl is disappearing, and consequently, so are the Spotted Owls. This owl is the canary-in-the-coalmine for old-growth forests and its disappearance is an indication that the entire ecosystem is failing due to the over-cutting of trees. Saving the Spotted Owl means saving old-growth forests. happy on their new corner. 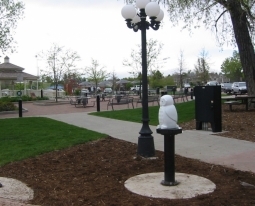 The Owl is carved from Colorado Yule Marble, famous for its snowflake crystal. When displayed outside, the sculpture sparkles in the sun exactly like the sparkle of fresh snow. “See Through Other Eyes: Spotted Owl” is for sale through Douglas County Art Encounters to municipalities, organizations, and private collectors as part of the Art Encounters program. A portion of the proceeds from the sale of this sculpture will be donated to help protect Northern Spotted Owls and old-growth forests. Ellen Woodbury was a Directing Animator and Character Animator at Walt Disney Feature Animation for 20 years. She is now 10 years into her second creative career as a fine art stone sculptor. One medium inspires and informs another in the ascending spiral of creative discovery. What a blast!